(FORT WAYNE, INDIANA – July 12, 2018) Employee Plans, a leading Third Party Administrator in the Midwest, announced today that Vice President of Client Services, Denny Wright, was awarded the Presidential Citation Award at the National Association of Health Underwriters’ (NAHU) 88th Annual Convention and Exhibition in Kansas City, MO. Denny was recognized for this award for increasing chapter membership, retaining membership, sponsoring continued education courses, hosting speakers and presentations, bolstering relationships with industry partners, and meeting with state legislators. 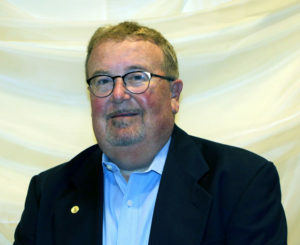 He is the Immediate Past President of the Indiana State Association of Health Underwriters. Wright has been a member of the National Association of Health Underwriters (NAHU) since 1998 and has held numerous leadership positions at the local, state, regional and national levels of NAHU. “Denny Wright exemplifies the dedication to providing the best opportunities for our members,” said Don Griffey, President of the Indiana State Association of Health Underwriters. “This year, ISAHU organized several community events, as part of our communications efforts and hosted multiple seminars to educate members and consumers. These projects and many others have set a standard of excellence in the health insurance industry that we are proud to represent,” added Griffey. Employee Plans is a Third Party Administrator in employee benefits. We offer administrative services such as medical and pharmacy, dental, vision, disability, COBRA, HIPAA, HRA, HSA and FSA to employers who wish to provide great service at a competitive price. Headquartered in Fort Wayne, Indiana, we are a part of the Prime Risk Partner family. Prime Risk Partners, headquartered in Atlanta, Georgia, is building a superior national insurance distribution platform through selective acquisitions, strategic new hires, and thoughtful operations. A portfolio company of Thomas H. Lee Partners, it is quickly becoming the partner of choice for industry professionals looking to grow exponentially while becoming a critical piece of an expanding national organization. Please visit www.employeeplansllc.com and www.primeriskpartners.com to learn more. The Indiana State Association of Health Underwriters represents brokers, agents, and health and life insurance professionals across Indiana plus Indiana’s seven local chapters. ISAHU supports its members’ health and financial security needs through charity events, networking, conferences and summits, and online learning. ISAHU also plays an active role in shepherding legislation in the Indiana House and Senate as well as maintaining close working relationships with Indiana’s Congressional and Senate delegation. The National Association of Health Underwriters represents 100,000 professional health insurance agents and brokers who provide insurance for millions of Americans. NAHU is headquartered in Washington, DC. For more information visit the NAHU website at www.nahu.org.